Vice Governor Ramil Gentugaya yesterday broke his silence and said that his “ambition to run for Congress in 2010 remains”. “However, being a member of the Lakas-CMD party, I will abide by the decision on however the party will endorse as the standard bearer, ” he said in a text message. “At this point no one has been endorsed yet, thus the field is still open. Anything is possible,” he added. It is about two weeks until yesterday that Gentugaya had been mum on the local press following the revelation of congressional wannabe Boardmember Maricar Zamora-Apsay that she had participated in a leadership training at Tagbilaran City in Bohol sponsored by the Lakas-CMD nationale directorate. Later this month she is slated to undergo another leadership training for women Lakas leaders in Manila. The same the Lakas national directorate will foot the bill for its Manila affair. Observers said that the Lakas-CMD national directorate appears to be already grooming Apsay as its pick for standard bearer for the post that her father Cong. Manuel “Way Kurat” will be leaving by 2010. But others see otherwise, saying it is the Lakas local leadership, the provincial directorate chaired by Governor Arturo “Chiongkee” Uy which has the “greater voice” in the choice of the standard bearer. As this developed, a source said that former Cong. Roger “RMS” Sarmiento is already going for a comeback as he would reportedly run to vie against Gentugaya or Maricar, or both in a scenario of a three-corner fight over the District 1 congressional post. Compostela Barangay Poblacion secretary Pepot Garcia said that he was approached recently by a Compostela resident and former manager of the Sarmientos who said that Roger Sarmiento is girding to run to reclaim the congressional post that he bequeathed to Cong. Zamora when he ran but lost as governor against former Gov. Jose “Joecab” Caballero in 2001 polls. Provincial elder Prospero Amatong was also reportedly qouted as saying that Sarmiento would be running for the post, mediaman Rudy Calansingin said. 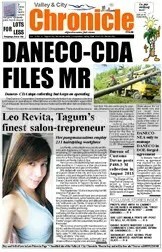 TAGUM CITY- A provincial officer of the Dept. of Labor and Employment has bared here that there are cases when the workers themselves cover the violations of their employers on the minimum wage law. “Di sila kaako motug-an sa gipanghimo sa ilang employer sa ila (They cannot afford to tell to the labor department what their employers have been doing),” said Albert Degamo, DOLE provincial officer in Davao del Norte during yesterday’s edition of the Kapihan sa Kapitolyo in the Media Center, Capitol at Mankilam. Degamo however bared that his office has been hearing cases every Monday relating to labor standards including those covering minimum wage laws and orders. He could not though cite provincial statistics on the extent of violations of employers and businesses on mandated minimum wage of the workers. Instead he cited that his agency has three frameworks in enforcing the minimum wage law. He said that at the latest Wage Order 15 made by the Regional Tripartite Wages and Productivity Board-XI the workers in the region employed in businesses having 10 or more workers the current effective rate for minimum wage is P265 per day from P250 per day for the period June 16 to Sept. 16, 2008. The framework to be taken for businesses having 1 to 9 workers requires only technical visit during which employers are only required to give their action plan on the minimum wage, adding that DOLE is still giving small businesses “time to grow”. “For businesses having 10 to 129 workers, we do inspection on whether they comply with the law and enforce our labor standard laws,” Degamo said. “For those having 200 workers or more, we make no inspection but rely the self-assessment on implementation of minimum wage on labor unions as embodied in their collective bargaining agreement (CBA) (with their employers),” he added. The Tagum City Council will make due corrections and revisions to their Urban Poor Ordinance that was not confirmed and returned by the Sangguniang Panlalawigan to the City Hall Monday. “My committee will find pursue to find ways to address the problems of the urban poor,” he said. He added that for this his committee is also presently crafting the city’s housing code and reviewing the zoning ordinance. The known Urban Poor Ordinance of Suaybaguio, City Ordinance 302, sought to defer for five years the issuance of accreditation and approval of development plans to new urban poor associations wanting to undertake housing subdivisions projects for their members. The City Hall came up with the measure to stop urban poor housing projects that it said resulted to low occupancy, underdevelopment and blight due to lack of basic facilities and services such as access roads, drainage, water system, power and electricity, solid waste disposal system, and other facilities. It however gave exemptions to ten community associations which are still on the process of complying the necessary permits and those which have already approved preliminary approval and locational clearance (PALC) and development permit (DP) but with a low occupancy rate will be subjected to verification process to be conducted by the City Planning and Development Office. Listed exempted were Barangay Magugpo East Urban Poor Homeowners Association, Curvada-Magdum Homeowners Association, Immaculada Concepcion Urban Poor Homeowners Association, Malinawon Urban Poor Homeowners Association, San Antonio Homeowners Association, San Jose Homeowners Association, San Rafael Homeowners Association, Tagum CEBOLE Homeowners Association, Inc., Velasco Urban Poor Homeowners Association – Phase 1, and Velasco Urban Poor Homeowners Association – Phase 2. The last time I got an opportunity to interview today’s best known provincial elder-statesman Prospero “Pros” Amatong was in the late 80s, when he was still the governor of the erstwhile undivided Davao del Norte. That time I was then with the defunct Northern Star published by late Cesar “Rasec” Sotto. Thursday was like the same day repeating in terms of ambiance in my interview with him in the 80s. The grand old man in Davao del Norte-Comval politics was still at his signature form at home: he donned pure cotton white shirt and shorts, while Ma’am Luz sit nearby. The same – he has been smoking menthol then and now. For all those greatest political and electoral feats after over 4 decades in public service, Pros Amatong remains down-to-earth and charismatic, speaks candid, terse jab, punch lines and unleashes keen political thoughts, while the Amatong ancestral house in Purok 3, Nabunturan remains largely the same inside: wooden, archaic and its kitchen downstairs can still be seen from the sala. Nabunturan’s greatest father is unblemished: not a single Ombudsman complaint, not even from anonymous complainant, has been filed against him in his 45 years of public service. He’s one unscathed after serving as Nabunturan councilor (3 years), Nabunturan mayor (14 years, 2 years in New Corella), undivided Davao del Norte governor (9 years), District 2 Comval congressman (9 years), 2 years as project manager of the Philippine National Oil Corp. and 6 years as project engineer of the then Bureau of Public Works, his first stint in government. He has two episodes when his mandate was cut short: the first on September 28, 1977 when he was purged by dictator Marcos for being with the opposition and replaced by Vice Mayor Zosimo Bugas who served for 4 years, and on March 31, 1986, after reclaiming his mayoral seat in 1980 polls, when he was appointed by President Cory Aquino as the OIC governor of the Davao del Norte. Now at 77, Nabunturan’s kingmaker visibly remains yet so influential in town and even the whole province despite his exit from political corridor of power in 2007. “When I say I’ll no longer run, I’ll not run,” he says in vernacular adding that he differs to others who make a lot of fuss over their political decisions. His decision of no longer running for office in 2007 polls is tough class act of seasoned and experienced politician. But from it, he bequeathed his political power to his successor son now Cong. Rommel “Bobong” Amatong. At a time when he retired began the baptism of fire in politics of his political heir. All out of the service-rich patriarch, the neophyte scion becomes a shoo in. This shows though particularly for Davao del Norte now that there were no two or more Amatongs holding the reins of power at the same time. In the circles of politicians and barangay kapitans asking for projects from him, his bluntness is well known. Davao del Norte Vice Gov. Victorio “Baby” Suaybaguio recalls that when Amatong fumed anger he surely would give the proponent the project requested. “It’s like a situation of a father scolding a son,” Suaybaguio says as he recalls how Amatong counterparted much for the province when he built Totit during VG Baby’s stint as Tagum mayor. It’s in Amatong’s brand of management that government projects must always be placed on the ground based on “felt need”. Same words then and now. Visibly this is one of the cornerstones why he stayed long in public office. “The felt need is determined by experience,“ he says. When he went on a spree of opening new roads and building bridges in farthest villages across the then undivided Davao del Norte after EDSA Uno people power, he ended up beloved by many not only in Comval but also in Davnor. As to one of the values he holds dear, he talks on the need of a no-changing character that must be in place in every politician regardless of the stardom status one may have reached in his political career. But, he added, it should be the people themselves who’ll remind politicians in power who’ve changed in character. Pahugtan pa gayud ug ensakto ang pagbantay sa kapulisan sa seguridad sa syudad karong adlawa nga bisperas na sa kapistahan ni Patron Kristong Hari sa syudad sa Tagum. Magduha na ka semana sugod nga gipataas sa kapulisan ngadto sa heightened alert ang ilang 0agbantay sa kalinaw sa syudad. Sa pagpahugot sa kapulisan sa ilang pag-gwardya aktibong ginamobilisar usab ang mga barangay tanod, matud pa ni Tagum City police chief Dario Gunabe sa pakighinabi kagahapon. Subay niini, ang hepe sa kapulisan nanawagan usab sa suporta sa katawhan sa pagsalmot sa pagbantay sa kalinaw tungod kay matud niya gamay ra gayud ang mga elemento sa kapulisan ikumpara sa kadaghanon sa katawhan sa syudad. Bisan niini kanunay pa gihapong alerto ug aktibo ang kapulisan sa pagpakgang sa mga krimen nga makadaut sa maayong estado sa kahusay ug kalinaw sa syudad, dugang pa ni PSupt. Gunabe. Siya usab mipahibalo nga sa natalang estadistika sa kapulisan sa tibouk nasud nakit-an nga sa bulan sa Nobyembre ug Disyembre partikularmente sa panahon sa kapaskuhan taas gayud ang national rate sa crime against property. Nagpasabot, matud niya, nga modaghan ang mga kaso sa kawat, pagpanglungkab ug uban pang krimen batok sa propriedad. 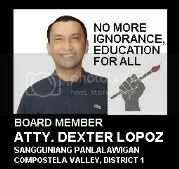 Former Compostela Valley District 2 Congressman Prospero Amatong bared yesterday that the real recipient of of the so-called Bolante fertilizer was the Department of Agriculture-XI and that his congressional office then just coordinated its distribution to the farmers in his district. “We just identified the recipients of the fertilizer,” he said in an exclusive interview. He added that the fertilizer was a cargo and he shied away from micro-managing it. “Sila na adto, bagahi to siya ug kapoy kung ako pay mangunay adto,” he added. Even then, he said there was an auditing team from Commission on Audit which went to his congressional office and cleared the transaction. “The Bolante fertilizer just passed in my congressional office,” he said, adding that he had not much thought of it since he saw mayors and farmers in the province also coordinating DA-XI to access it. He said his office ultimately received goods in the form of fertilizer and not money. He recalled that his office received the fertilizer close before the elections and that its distribution went beyond the elections due to the election ban. Asked on how he is seeing the investigation on the P728-million fertilizer fund scam reportedly pulled by former agriculture undersecretary Jocelyn “Jocjoc” Bolante before the May 2004 polls, he said that the current drift of pinning down the suppliers and the DA “is good” and that those culpable could be uncovered through a “paper trail” and “missing links”. The recognized provincial elder has been undefeated in electoral races in his 50 year of public service during which not a single Ombudsman complaint, even from anonymous sender, was filed against him. His son Cong. Rommel Amatong is taking his footsteps at present. Earlier, several incumbents during the 2004 polls had already spoken on the Bolante fertilizer scam. Davao del Norte Gov. Rodolfo del Rosario in a TV report said he did not receive the Bolante fertilizer but drip irrigation projects to boost vegetable production in his province. On Monday Davao del Norte Cong. Arrel Olano (District 1) admitted he received Bolante’s fertilizer and distributed it to some 6,000 farmers in Asuncion, Kapalong, San Isidro and Talaingod towns. He said his recipients could be verified right in the field. Olano said that he started distributing the fertilizer before the May 2004 polls and stopped when the election period began. He said he continued distributing the fertilizer after the elections. Last Sunday, Comval Cong. Manuel “Way Kurat” Zamora (District 1) admitted, too, he received fertilizer but only in August 2004, after the May polls in that year. Zamora said his recipients included even the farrmers belonging to the militant Kilusang Magbubukid sa Pilipinas in his province. He said the transaction was “duly accounted for” and that he has a list of recipient barangay captains throughout his district except Monkayo town. where he did not distribute the fertilizer as Zamora were at political odds then with Mayor Manuel Brillantes. Both Olano and Zamora said they did not receive money but only fertilizer. Early last week, former Comval Gov. Jose Caballero said he did not receive any fertilizer nor money for it, although he complied with the requirements asked by the DA for him to access the so-called Bolante fertilizer. Former Davao del Norte Cong. Antonio “Tonyboy” del Rosario (District 2) has yet to issue a statement on the issue to the local press. Bolante has been accused of engineering the alleged diversion of P728 million to the 2004 campaign kitty of President Gloria Macapagal-Arroyo, whom he had cleared to have not been involved in the scam, along with other names of local officials and congressmen who were identified as proponents of the fertilizer funds. There was that buzz last week that the cityhoood in Nabunturan is forthcoming. Was it another diversionary stuff for the P90-million bond flotation that the town’s administration pushes to be implemented? (The bond float pushers are now respondents to an injunction case filed by representatives of people initiative petitioners in town. We’ll not touch this for now at the risk of being held in contempt of court). But sadly, for Nabunturan, the cityhood isn’t really coming (so with Sto. Tomas in Davao del Norte) since the Supreme Court the other day struck out the 16 new cities including the near Mati in Davao Oriental, Bayugan, Agusan del Sur, Cabadbaran, Agusan del Norte and Tandag, Surigao del Sur. They’re now back as municipalities! Forget the costly hoopla and celebrations when these towns became cities via Congress and not via the requirements of the New Local Government Code. What now magistrates, when the “city” officials have been already called as city mayores, city vice mayores and city konsehales? Throw into the garbage cans their calling cards, stationeries, and discard the new “city” logo and seal, or put white-outs to the word “city” in the birth and marriage certificates of those who were born and who married during the time when Mati, Bayugan, Cabadbaran and Tandag were still called as “cities”? In declaring the 16 cityhoood laws unconstitutional, the High Couirt pointed out: “The Constitution is clear. The creation of local government units must follow the criteria established in the Local Government Code and not in any other law. There is only one Local Government Code. The Constitution requires Congress to stipulate in the Local Government Code all the criteria necessary for the creation of a city, including the conversion of a municipality into a city. Congress cannot write such criteria in any other law, like the Cityhood Laws.” It’s really a big sorry for our four neighboring towns. The trouble with their city conversion was that they had their congressmen sponsored their respective cityhood bills when their annual income had not yet hit the P100-million mark. They asked for exemption for it and the Congress granted. That’s via legislative fiat. Really, forget the congressmen unless they sponsor for the further revision of the New Local Government Code (LGC) and not file bill through the short-cut, backdoor route. You see there’s that ultra-resistence from the cities as the SC’s nullification came from the court case filed by the the league of cities. They, like Tagum City, just don’t want more towns to become cities to eat with them the big IRA allocation for the cities. But now the real route to cityhood is the New Local Government Code, as amended. Through this, the 3 requirements are needed: 100 square kilometer land area, 150,000 population based on the latest 2007 census and P100 million annual income. Nabunturan has 245.26 sq. kms land area, check. In 2007 census, it has only 67,365 population, fail. By next month, the town’s real income is still less than P100 million as the P40-50 million is still a planned borrowing for the bond float. I said it before, at the very least, the town could only hit the 150,000 population mark in 15 years. Monkayo is more dejado since it already has the land and income requirements. If Mayor Manuel Brillantes is wise enough, he’ll have to lobby for the correction of the wrong boundary line of Comval’s north and Monkayo gets big chunks of population of Laak, and the Agusan del Sur towns of Santa Josefa and Veruela, and presto, it immediately qualifies to become a city. In 2007 census, Monkayo has 90,971 population.